Get ready for the ultimate face-off as five mutant superheroes, also known as X-Men, battle five of the world's fiercest villains in their attempt to restore the order and harmony. The superheroes are ready to help the human kind by taking on their most feared opponents, but are you ready to help them? Play your part in the triumph of good over evil and you will become a hero as well, enjoying the full benefits of the new-found status. Probably the most famous of all Marvel comics, the X-Men has made its way to online casinos in 2010 and has remained very popular among online gamers everywhere. The 5 reel 25 payline video slot will blow your mind with vivid characters, numerous special features and four progressive jackpots. Chances are you will be thoroughly enjoying the game and if you win some money in the process that will be an added bonus. 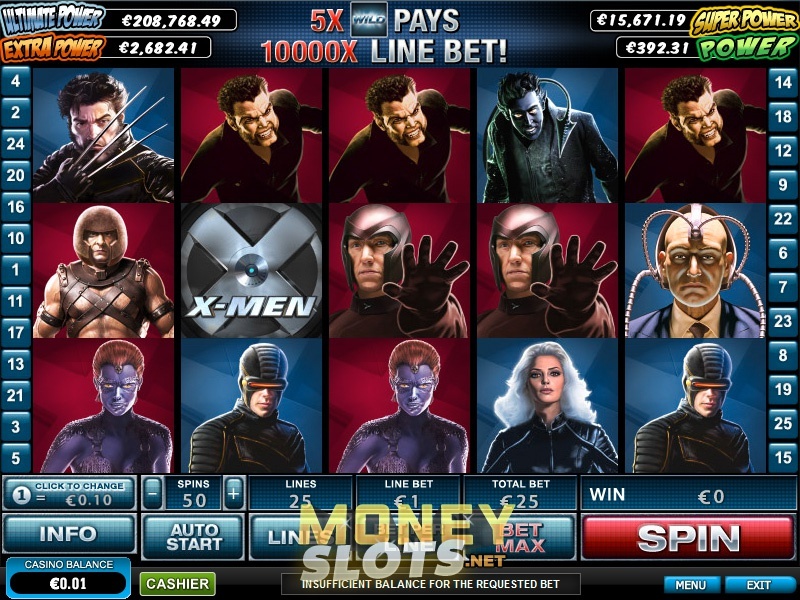 The X-Men slot game features the most interesting characters from the film series, with five heroes represented by Professor Xavier, Wolverine, Nightcrawler, Storm and Cyclops. Magneto, Mystique, Juggernaut, Sabretooth and Lady Deathstrike act as villains. X-Men logo is the Scatter here, whereas letters wild act as the Wild icon. Most of the symbols come to life when they form a winning combination. There are not too many coin denominations, with $0.01 to $1 being the betting range, but you can cover up to 25 paylines and bet 1-10 coins per spin. Wild logo replaces all other symbols with the exception of scattered X-Men logos. Three or more X-Men Scatters trigger the Heroes vs Villains free spin round. X-feature is activated when five heroes form an X on the reels, in which case you are awarded 5x your total line bet. Progressive jackpot game may be triggered at random, but the more you bet the bigger the chance of winning one of four jackpots. Five Wild logo icons carry a 10,000 coins maximum payout, whereas Magneto and Professor Xavier act as Extra Wilds in free spins mode. Heroes vs Villains Bonus is one of the best we have seen on the web, so make sure to look out for those X-Men Scatters. X-Men is probably the most popular of all Marvel slots, and it is obviously linked to Marvel Mystery Jackpot that can occur at random at any time. This is the reason you might want to spend as much time as possible at the reels, while your chances of triggering the jackpot game increase with your bet size. If the jackpot game is activated it means you have won one of four jackpots and it only remains to be seen which one. Symbols representing the four jackpots are hidden behind 20 icons and the first three matching symbols that appear will tell you which of the four jackpots you have won.